Hugo Boss HB1513340. Genuine Hugo Boss HB1513340. Hugo Boss Ikon 1513340 is an amazing and special Gents watch. Material of the case is PVD Gold plated while the dial colour is Dark Blue. The features of the watch include (among others) a chronograf. Dial Colour: Black. Case depth approx. : 12mm. Case Material: Stainless Steel. Case Shape: Round. Case width approx. : 41mm. More Products. Get Social. Clasp type: Butterfly. The Powermatic 80 calibre makes a power reserve of up to 80 hours possible! Buckle: Diver extension Stainless steel 316L Deploying clasp with 2 push-buttons and diver extension. Case: DS Concept Stainless steel 316L. Model number BU9363. Watch Face Colour. Strap Colour. Watch type. Stainless steel. Water Resistant. Strap Style. Model number CW2111. 1 YR PRESTIGE WATCHES WARRANTY. 1 YR WARRANTY. - With Box & Papers?. AUTOMATIC CHRONOGRAPH. With Box & Papers?. supplied with BOX/ PAPERS and warranty/. Complete with BOX/ PAPERS AND WARRANTY. Burberry BU9800. Model - BU9800. Hand made for the big occasion, alot of watch for the price! Really nice contrast between the sharp silver body and black face. Any manufacturer faults will be inspected upon arrival back. 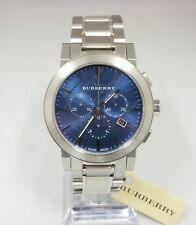 Burberry BU9363. Model - BU9363. Influenced by London's iconic skyline, this beautiful watch captures vibrancy and modern architecture. Sharp Blue face with Silver strap shows this watch off in the best light. NUOVO Donna Emporio Armani Argento Madreperla Orologio AR2511 2 anno di garanzia! Emporio Armani AR2511. 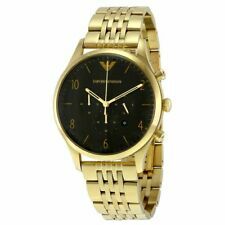 Genuine Emporio Armani AR2511 is an amazing and eye-catching Ladies watch. Material of the case is Stainless Steel while the dial colour is Mother of pearl. It can be worn while washing your hands and will be fine in rain. Nautec No Limit 300M Shore Automatic Watch. 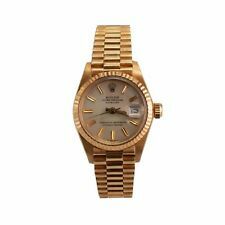 - The quality and aesthetics of this watch easily makes this compete with watches in the £300 price range, for only £90 this honestly is the best value watch on the market by far. Hugo Boss HB1512567. Other features include chronograph, date function and the piece fastens with a black leather strap. Any manufacturer faults will be inspected upon arrival back. Dial Colour - Black. An excellent condition pre-owned gentleman's Patek Philippe Aquanaut (5167/1A-001). AGEJULY 2016. OUR WARRANTY12 MONTHS. Hugo Boss Aeroliner HB1513180 is a super very impressive Gents watch. Case is made out of Black Ion-plated Steel and the Black dial gives the watch that unique look. The features of the watch include (among others) a chronograf and date function. Recently serviced, all functions working fine. ( MK5799 ). MINI BRADSHAW CHRONOGRAPH. PRE OWNED VERY GOOD CONDITION. INCLUDES ORIGINAL BOX. SEE PICTURES. I will provide the receipt. I loved it so much that I have decided to upgrade to the newer model. Hugo Boss HB1512963. The case material is stainless steel, the dark blue face gives the watch that unique look. The features of the watch include a chronograph. Smart and bold, this watch is perfect for any occasion! MPN: HB1512567. Other features include chronograph, date function and the piece fastens with a black leather strap. Strap type: Genuine Leather. Strap Colour: Black. Dial Colour: Black. Case width approx: 44mm. This watch features a bold black dial with rose gold-tone stick hour markers, 3 subdials forthe chrongraph and a date window for extra functionality. The black croc embossed leather strap gives the contrasting rose gold-tone round casing an extra touch of elegance. Width with crown. Width without crown. Manufacturers papers. Manufacturers box. Year of Manufacture. The watchband is made of Silicone and has a black colour. The dial is protected by Mineralglass. Official TW Steel Moto GP Watch. Face Colour Black. Popular Categories. Clothing & Jewellery. Glass Mineral. Dial Colour: Black. Case depth approx. : 12mm. Case Material: Stainless Steel. Strap colour: Black. Case Shape: Round. Case width approx. : 47mm. Clasp type: Strap Buckle. Everything supplied from new including the original warranty card (under manufacturers warranty until March 2020). March 2018-Original Box and Books, Warranty Card. Didun design Ap ROYAL OAK HOMAGE. PREMIUM QUALITY DIDUN 40mm Date watch with Solid Steel Case And JAPAN. Didun Design Luxury Premium Quality. Didun Date watch. Full size - 41mm without crown. 316L Stainless steel case (Silver), 41mm. Heuer Box and booklet only. Stainless steel case. Watch is running. Case in good condition – minor surface scratches. Year: 1998. Our team will respond asap to get things sorted for you ?. Condition Report. Black Tone Dial with Silver Tone Details. Silver Tone Stainless Steel Finished Hands. Silver Tone Stainless Steel Case. Silver Tone Stainless Steel Case Back. Silver Tone Stainless Steel Strap. Fast Adjust Date Feature. Shock-resistant construction protects against impact and vibration. Item Length: 4.3cm. Item Weight: 49.9g. In very good condition and fully working. No marks on the glass. UPC: Does Not Apply. AGEDECEMBER 2017. PRICE£5995.00. MODELDATEJUST 41MM. WARRANTYUNTIL DECEMBER 2022. Beautiful green dial. Great case size which will fit most wrists. Seiko Calibre 6R15 Automatic Self Winding Watch. The watch has barely been worn and is in mint condition, as the pictures will show. Hugo Boss HB1512960. Genuine Hugo Boss HB1512960. Hugo Boss 1512960 - A striking design from Hugo Boss. The dial features gold baton hour markers and high-vis hands along with 3 mini dials with chronograph function. Eberhard & Co. EXC Very minor signs of use only. MINT- Almost unmarked, only very tiny rubs. MINT Totally unmarked. Gradings guide. Model: BU7703. Manufacturer: Burberry. Case Material: Stainless Steel. Any manufacturer faults are subject to a full inspection. Dial Colour: Black. A luxurious Dreyfuss watch with a leather strap that secures with a buckle clasp. This watch is automatic. Water Resistant -Seafarer Standard (Dreyfuss & Co). Seafarer Standard (Dreyfuss & Co). R.R.P £825.